Flintlock Guns. 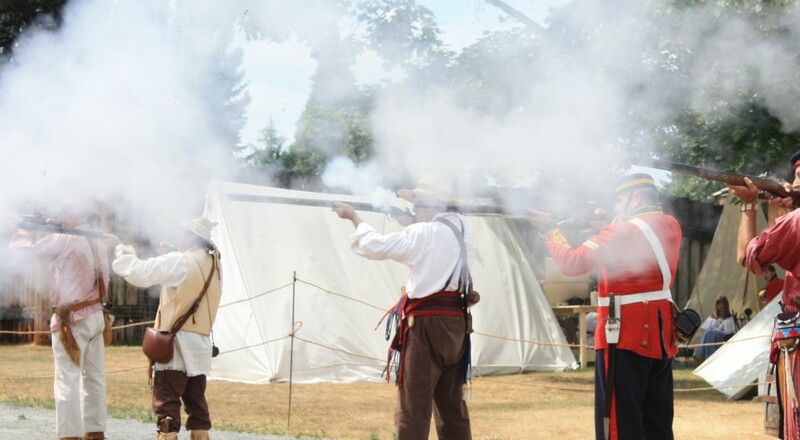 This image is from Brigade Days at Fort Langley, but these guns were the same that all the HBC men used. The Indigenous people had flintlocks as well, but they were not as well made as those owned by the HBC men. I want to make it clear immediately that the Fort Simpson I am speaking of here is NOT the Fort Simpson that stood on the banks of the Mackenzie River. This Fort Simpson was on the North West Coast — on the Nass River just south of Russian Territory (the Alaska panhandle). As a matter of fact, when the HBC ships sailed up the estuary of the Nass to the first fort, which had been built as far east as the ships could go, they knew that British territory was on their right hand, while Russian territory was on their left. The current Fort Simpson was located in an isolated bay that lay far up the estuary of the Nass River. When [Peter Skene] Ogden had built the fort in the summer of 1831, he had thought it was a good location, close to Native fisheries and at the end of a second grease trail that brought rich interior furs to the coast. However, in every season but summer the north winds whistled around the walls of the fort and turned its harbour into a dangerous anchorage. Ogden had a shipload of men and supplies to build a fur-trade fort, so he decided to rebuild Fort Simpson in a better location. On July 19 1834, the HBC men reached the outer estuary of the Nass, and began to look for a good site for the new post. As always, they looked for a supply of fresh water, a stretch of level ground, and good timber with which to build the palisades. In the end the HBC men had a choice of two locations, and they chose the one with the better anchorage. The men, which included my great grandfather A.C. Anderson, and my g.g.grandfather James Birnie and his family, began to build the new fort, while the Dryad, and Ogden, headed up the estuary to the location of the old fort. With Ogden was Donald Manson, who was the man in charge of dismantling the first Fort Simpson. Within the week, Manson’s men had taken apart two buildings and storied them in pieces aboard the Dryad. These were immediately delivered to the new fort, to be rebuilt inside its palisades. My book tells the story of the building of the new fort, but the more interesting story is the dismantling of the old fort. This is how it went: beginning with a quote from The Pathfinder. At old Fort Simpson, the men dismantled the remaining buildings and loaded them in pieces aboard the Dryad. In the three years the post had stood on this rocky point, the Nisga’a people had not been troublesome or dishonest, though the Company men knew them to be some of the most treacherous on the coast. Now, however, the Nisga’a understood the fort was moving out of their territory, and they showed their displeasure by gathering outside the pickets. A dozen Natives with muskets stood on the hill behind the fort, where they threatened to take potshots through the now flimsy barricade. Closer to the fort all, armed Nisga’a gathered at a place where they could mount the remaining pickets. 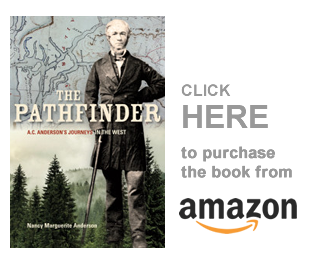 The early annals of Fort Simpson show how arduous a task its factors — Chief Trader Aemilius Simpson, John Work, and Peter Skene Ogden — had taken upon themselves. The establishment was many times besieged by the natives, and its safety was threatened. Originally known as Fort Nass, it was founded in 1831, near the mouth of the Nass River close to Portland Canal, at a place on tidewater now named Graveyard Point, previously known as Fort Point or Cemetery Point, and to the Indians, Suskanmilks. We may wonder why its founders had so unwisely selected this inhospitable shore, which was rocky, almost devoid of fresh water, without a harbour, exposed to the strong winds of the Nass sweeping down the river for nearly three months in the year, where the cold in winter prevented the Indians from approaching, and made it risky in other seasons for the coast Indians to venture forth in their canoes because of the treacherous disposition of the river natives. Perhaps it was because the point seemed sheltered, was close to the Russian frontier and less than a score of miles from Fishery Bay on the Nass where three nations — the Tsimsyan, the Tlkinkit and the Haida — gathered in spring for oolachen (candlefish) fishing and barter. Fishery Bay, with its rows of huts extending miles on both shores near the end of tide water, stood at the head of Grease Trails (so called because of the oolachen or candlefish grease, a vital commodity) reaching out fan wise into the interior. Had nothing to do while at Nass but attend to my patients — weather very rainy…. On Saturday morning rum had been sold to the Indians and some of them getting intoxicated were very turbulent and from noon till sunset when we embarked we were all under arms and in momentary expectation of having to fight our way on board or being butchered on the spot. They attempted frequently to beat down the slight barricade raised on the site of the bastions, but were deterred on seeing us ready with firearms to send a volley among the intruders. About a dozen or twenty Indians with muskets were posted on a hill immediately behind from when[ce] they could fire with deadly effect into the Fort at any part. Outside the pickets they were numerous and armed with guns, boarding pikes and knives and endeavouring by their savage whoops and yells to intimidate us. Remained quite in this state for sometime but owing to a temporary lull in the clamour outside, ventured to send a few articles to the boats which were in waiting at the beach, one or two had passed down with wooden utensils unmolested — no Indians appearing in sight — another man was proceeding with a barrel full of miscellaneous articles, and unheeded when at once several armed villains rushed out from amongst the bushes — and one more inebriated and thence more daring than the rest seized the barrel and with drawn dagger drove the man from his charge — he returned to the fort and first meeting me I went out but seeing the savage advancing with his knife aloft in a menacing attitude I stopped slowly to the gate and procured a cutlass from the doorkeeper. Thus armed I walked toward the Indian who was surrounded by his friends persuading him to desist and at the same time Kennedy issued and addressed the savages — the barrel was rolled to the beach in the meantime without molestation. To the HBC men, it was always important not to “show a white feather” to an Indigenous man. In other words, the HBC men did not back down from a fight unless the odds were so against them that they had no hope of winning. But this was a battle that could be won — the chiefs were on their side, as you will see. Soon after a gun was fired from the woods at one of the people employed at the strand, the ball whizzing past his ear. Every thing of value having been already embarked no further attempts were made to ship was remained. Red Shirt, the Indian just mentioned, was, to prevent his doing mischief outside, admitted into the Fort and was immediately assailed by Caxetan, the chief, with a volley of abuse for his conduct. From words they soon came to blows. Red Shirt’s dagger was prevented from doing mischief by two sober Indians, Jones and Couguele, but being a tough active fellow he still retained it in his grasp and managed, with the other hand, most cruelly to abuse Caxetan’s visage, who on his part fought bravely tooth and nail, considerably damaging his opponents visual organs. Mr Ogden at length got Caxetan and Jones to accompany him on board and once there retained them as hostage for our safety. Now prepared to abandon the Fort and held a debate as to the propriety of leaving behind a cask containing 25 gallons Indian Rum. It was left, Kennedy being the only person who wished to take it along with us. Took the precaution of drawing the priming from all the superfluous muskets after each man had been provided with one. As soon as the gate was opened, the armed natives collected around. I went out first and stood at the threshold until the last person had issued. The natives then rushed in to pillage and we reached the boats unmolested. Soon after, to our astonishment, Caxetan and Jones from the bank shouted to us, that they wished us to send the boat for the Rum, and on our refusing, offered to bring it on board themselves. They were then told to appropriate it to themselves and on this intelligence they brought the rum on board the vessel to be divided by us. This act proved them to be possessed of more prudence and foresight than we would have given them credit for. Had the division been made amongst themselves bloodshed would in all likelihood have ensued. All night constant hammering was kept up in the deserted fort and dawn revealed several gaps in the pickets made by those who were intent on procuring the iron spikes which attached the pickets to the bars. It blew a NE. We set sail soon after daybreak, bidding adieu without regret to the inhospitable regime of Nass, and in the evening, after a pleasant sail, anchored in McLoughlin’s Harbour at the new settlement. Copyright, Nancy Marguerite Anderson, 2019. All rights reserved.